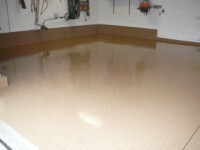 Many people are now updating their garage floor with an epoxy coating. Epoxy is an excellent product, but the truley good epoxies should only be used by professionals. Every time I walk into a Home Depot or Lowes store I cringe when I see the epoxy kits for garage floors for a few reasons. These epoxies are at a do it yourself “strenght”. Many people that have put these down experience flaking with in a couple of years. Also a do it yourselfer doesn’t have access to a diamond floor grinder that would allow for proper prep of the concrete surface. An finally most of these “kits” don’t come with a clear top coat for added protection. If you want to have a professional do it expect to pay around $3.50 to $4.50 per square foot. This entry was posted in epoxy flooring and tagged do it yourself epoxy, epoxy garge floor, kansas city epoxy flooring. Bookmark the permalink.